Surprise your friends and family by making May’s fun and creative pop up card with our step-by- step guide. 1. With one of the card blanks, draw inside two pencil guidelines; make a mark 4cm in from both sides and 2.5cm from the top and bottom edge. Join your top and bottom pencil marks and cut the top and bottom lines using a craft knife. 2. Score a line from the beginning of the top cut line to the bottom cut line on each side of the card. Score a second line 2cm in from each side to create a panel. 3. With the second card blank, cover the inside with your chosen patterned 6 x 6 paper. We have used the green damask paper to complement the floral paper picked. Tip: Use the cut and score lines as a template to draw around on the back of the backing paper. 4. We have then used the Dovecraft Bohemian 6 x 6 floral patterned papers to cover the pop up card blank. Tip: Use two pieces of paper, giving space allowance around the score lines on the card on so it folds easily. 5. Stick the outside of the pop up card to the inside of the second card. Remember to not stick the centre of the card as we want this to pop out. 6. Cut two 17cm pieces of green ribbon and place both to the front of the card; stick each to the middle of the card so it can be tied into a bow. Cut two 15cm squares using the 6x6 paper pad to cover the front and back of the card. 7. 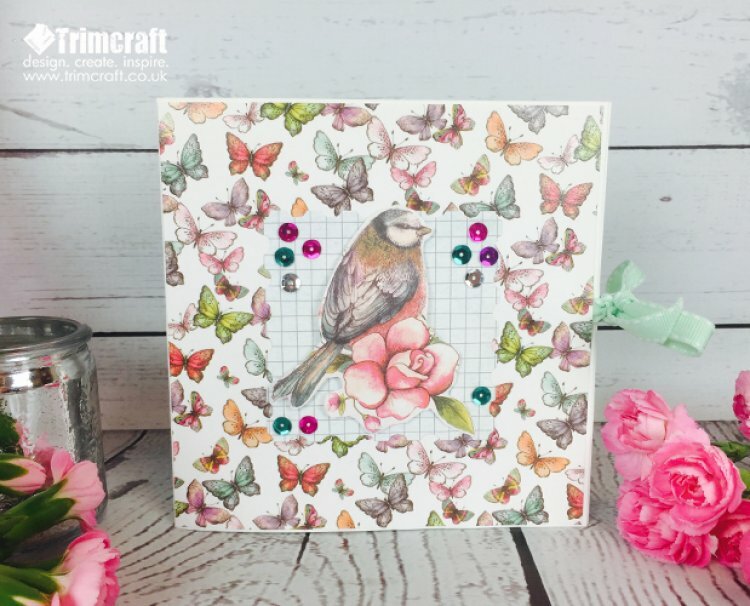 With a piece of backing paper, die cut a stamp shape using the third largest nesting stamp die and stick onto the front in the centre of the card. 8. Cut out one of the birds from the 12x12 pack and stick onto the centre of the nesting stamp die cut using foam pads to add dimension. We have layered some of foam pads on top of each other to add further depth to the image. For a finishing touch, add some sequins onto the front of the card in a scattered effect. 9. To decorate the inside of the card, print the ‘Just for you’ and ‘With Love’ stamps on a separate piece of patterned paper. Then cut to size and stick to centre pop up panels. 10. Surround your sentiment text with some printed butterfly toppers. With the front of the Dovecraft Bohemian 12x12 pad, cut some of the glitter butterflies out to size and add to the inside of the card. We have added some of the cut outs to the butterfly toppers. To complete the embellishments, we have added gems to the paper butterflies. Show us your pop up creations in the project gallery & next month we will have a new card shape master class for you!